Head to the Himalayas to experience Auli, one of the best winter sport destinations in India. This is where you'll take your first shaky steps on skis, slipping and sliding as you struggle to keep your balance. But four days later, you'll glide down the same slope with ease, admiring your own skills and how great it feels to ski. This 6 day skiing adventure in Auli involves 4 days of skiing lessons, where you'll learn the basics, like how to stand, balance, apply brakes, and manage runs and turns. There are experienced instructors to guide you through each step, although they can't prevent you from falling over many times during this course. On this skiing trip, you'll be staying in Joshimath and taking the daily chair car to Auli for your skiing lesssons. After the lessons are over, you'll walk back to Joshimath. The chair car takes you over 3.5-4 kms, with spectacular views of the white slopes and the peaks all around, especially Nanda Devi, Kamet, and Dronagiri. NOTE: This trip requires no previous experience and can be undertaken by enthusiastic beginners. Located in the Garhwal Himalayas of Uttarakhand, Auli is a prominent ski destination in India. With its high altitude and mammoth meadows, Auli's white undulating slopes are perfect for a thrilling ski adventure with the Himalayas towering in the background. There are nursery slopes for beginners to practise on, but when you're ready for it, the 3 kms slope is the ultimate thrill! Every day, you'll hitch a lift from Joshimath to Auli in one of the longest and highest chair cars in India, riding high above the tree tops and slopes. It's a fun way to get a bird's eye view of the gorgeous landscape, so don't forget to carry your camera! • Spend 6 days in the snowy paradise of Auli. • Learn to walk all over again, only this time with ski boots. • Take a ride on one of India's longest chair car rides, covering 3.9 kms in about 20 mins. 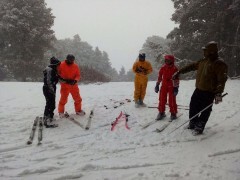 • Enjoy 4 hours of skiing lessons, and spend the rest of your day making snowmen or going for walks in the snow. 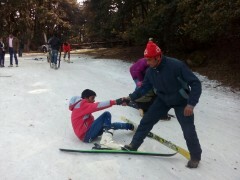 Participants must adhere to the instructions of the trip leader/guide at all times during the skiing in Auli. Consumption of alcoholic beverages/drugs and cigarettes during the Auli skiing course is strictly prohibited. For any cancellations made 24 days or more prior to the departure of Auli skiing course: 95% of the total trip cost will be refunded minus any transaction charges, or you can book any other trek within a year. For cancellations made between 14-24 days before the departure of the Auli skiing course: 70% of the total trip cost will be refunded minus any transaction charges, or you can choose to go for the same trek with any other batch within a year. For cancellations made between 10-14 days before the departure of the Auli skiing course: 50% of the total trip cost will be refunded minus any transaction charges, or you can choose to go on the same trek in the same season. For cancellations made less than 10 days before the departure of the Auli skiing course: No refund, but you can transfer the trek to a friend, for the same date. In case of transferring a trek to a friend, he/she should satisfy all the mandatory requirements of the operator. Participants will only be able to change their dates/batch of the trek depending on the seats available. 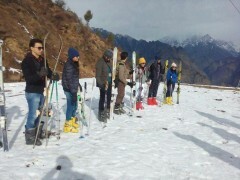 The operator reserves the right to change/cancel the plans for the skiing in Auli without prior notice if deemed necessary. No arguments or refunds will be entertained. 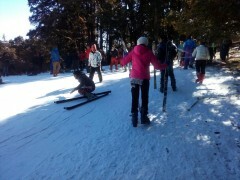 The operator is not liable or responsible for any injury, accident or death during this Auli skiing trip. 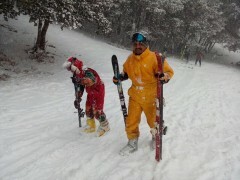 The cost for this Auli skiing trip does not include any kind of insurances or medical coverage/benefits. Participants below the age of 18 years old must provide a valid school/college ID proof or else will be charged the full amount. Participants are requested to carry two passport size photographs for the Auli skiing course and must have their ID proof handy whenever requested for. For any damage or loss of the ski equipment, the cost will be borne by the participant with a penalty cost charged extra. Arrive at Haridwar railway station by 06:00 hours and meet your operator. You'll be driven to Auli from here, in a shared private vehicle. It is an 8-hour long journey, and you'll be able to see the Alaknanda and Bhagirathi River flowing alongside, as well as the confluences of Devprayag and Rudraprayag. You'll get to Joshimath by evening and will settle into a comfortable guesthouse. You can go for a walk or spend a relaxed evening here. Overnight in guesthouse. It's your first day of skiing, so wake up early and eat a hearty breakfast. You'll head off in the cable car to hit the slopes, and will be given an introduction and briefing session by your instructor, followed by a fitting session for your skiing equipment. 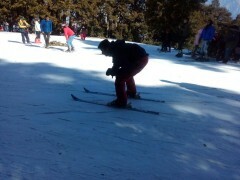 After that, you begin your first skiing session. Today you'll learn the basics of skiing from walking with ski boots to safely gearing up for the activity. You'll break for lunch at 13:00 hours and will have ample time to relax before you give the walking a try again. The evening is free for you to spend as you please. Overnight stay in guesthouse. Wake up to a scenic morning in Auli. Today you’ll take the chair car to Auli top again, and will start your lessons at Auli Top. You’ll learn how to stand in your ski boots today and you’ll slip, slide and stumble. Your progress is overlooked by experienced instructors who will make sure you learn all the tricks of the sport. You’ll break for lunch at 13:00 hours. After some rest you’ll head to a nursery slope by 14:30 hours to try out all you've learned. You’ll return to the guesthouse by 16:30 hours. Eat a delicious dinner and retire to your comfortable rooms for the night. Today you'll be learning some advanced skills on a gentle slope, and will practise parallel turns, how to brake using the snow plough technique, and practising everything you've learned over the last couple of days. You’ll break for lunch at 13:00 hours and will return to the slope at 14:30 hours for some more skiing fun. In the evening, after lessons are over, you can go for short hikes through snow-filled apple orchards, or relax in the guesthouse. Overnight stay in guesthouse. 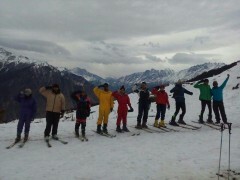 Day 5 of skiing in Auli: Advanced ski day! Today's the day you'll set foot on the advanced ski slope. 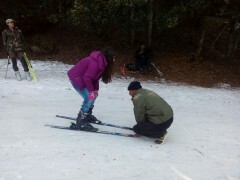 You'll go over your moves with the instructor for the first half of the session, and then you're standing at the top of the slope, looking down. One gentle push with your ski poles and you're off! You'll whizz down the slope, spraying snow in all directions, and execute some smooth moves. Your instructor will be with you at all times and you’ll feel more confident with the other skiers around. Afterwards, you'll be given a certificate of appreciation, and your skiing course comes to an end. Overnight in guesthouse. Wake up and have a relaxed breakfast before packing up and checking out. You’ll be driven back to Haridwar, and can relax on the 8-hour long drive and enjoy the scenic views. En route, you'll stop for lunch and snacks, and should reach Haridwar by 18:00 hours. Your trip ends here. Personal expenses like extra meals, packaged water, soft drinks, telephone calls, tips, etc. Shorts, jeans, light jogging pants, etc. You'll begin the day with a filling breakfast, and then will set out for your first ski lesson. By 13:00 hours, you'll break for lunch. In the evening, you return to your guesthouse for hot soup and snacks. The rest of the evening is free, and dinner is served at the guesthouse. You'll follow the same schedule today: breakfast, and then off to the slopes for lessons. You'll break for lunch at 13:00 hours, and in the evening, you'll return to the guesthouse where hot soup and snacks await you. You'll share a delicious dinner with your fellow skiers before retiring to your room. You'll spend the day like the day before: breakfast, and then off to the slopes for lessons. You'll break for lunch at 13:00 hours, and in the evening, you'll return to the guesthouse where hot soup and snacks await you. You'll share a delicious dinner with your fellow skiers before retiring to your room. It's your last day of skiing today, and you'll set out to the slopes with greater confidence. After your skiing session on the advanced slope, you'll return to the guesthouse by early afternoon. Here you'll celebrate your ski adventure with hot soup, and snacks. At night, after a hot dinner, you'll retire to your rooms at the guesthouse. You'll check out from the guesthouse after breakfast and will be driven to Haridwar railway station. You will halt for lunch and snacks on the way and can order and pay for your own meals. You should reach Haridwar by about 18:00 hrs. Your trip ends here. Haridwar is easily accessible via the well connected railways from across many cities like Mumbai, Delhi and Chennai. You can also opt for overnight buses from Delhi and Chandigarh to Haridwar. The operator will arrange your transport to the start point of the Auli skiing course.